One of the more popular illusions of contemporary art is that artists working in different media can scarcely communicate with one another. This would be news to Frederick Turner, the epic poet some of whose shorter poems are on this Web site, who not only has worked with a composer (Stefania DeKennessey set four of his poems into a Requiem for 9/11), but is a painter himself. Claudia Gary Annis is both a poet (some of her poems are online here) and a composer (among others, she's set poems by Frederick Turner and Shakespeare to music). And there's a precedent for Michael Curtis one can hardly ignore: Michelangelo, one of the world's great sculptors, was an accomplished poet as well. Below are both images of several sculptures by Michael Curtis as well as some of his poems from his book Broken Rhyme. And there is terror in her eyes. For the song of life within him. Like demons licking after sins. A shadow in the moonless night. But murdered it sinks to earth again. Held her, loved her, fed her. Unmothered by the earth would die. As the daughter tore hers. To dry upon the dirt. When earth aborts the seeds of men. Be held by the bonds of love. When woman bleeds. And that is all. Till millions, on millions, on millions come! And none of the pieces can be found! So, Boom! Boom! BOOM! Come beat the drum! From sea to sea on Cecilia's Day! Kiss 'yer neighbor, exchange her germs! Shake, rattle, and roll with Cecilia Jones! This mail suit and sword. I make a pretty show. 'Twas the thing to do. Michael Curtis received a classical training in painting, sculpture, and architecture. This training was concentrated in buon and secco fresco, egg tempera, black oil, and copper engraving. But following his studies at the Kunsthistories Library in Florence he became a statue maker and has worked in this field for over 20 years. His most significant sculptural commissions include The History of Texas at Texas Rangers Ball-Park, Arlington, Texas, the largest US frieze of the 20th Century; numerous portrait busts for the Library of Congress, The Supreme Court Building, and other public buildings. 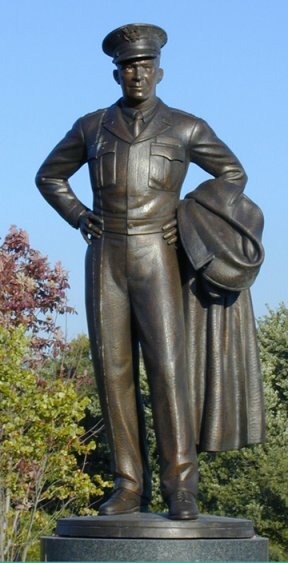 His recent statues include General Eisenhower and The Shipbuilder, both in Alexandria, Virginia; and current commissions include the Thurgood Marshall bust for the U.S. Courts Building, garden statues, portraits, et cetera. His specialty is relief portraits and fine medals. Also to his credit, Mr. Curtis has had over 30 one-man and group exhibitions; his painting, sculpture, and architectural drawings are represented in over 250 private and public collections. Although not a registered architect, he has produced architectural designs which have been built. For over 20 years Mr. Curtis has taught art and art history at art schools, colleges, and universities; too, he is a frequent lecturer, recently at the National Gallery of Art. His interest in art education has led him to chair the sculpture department at the Art League, and to sit on the Board of Governors of The University of Michigan School of Art. He was also a guest curator for two years at the Detroit Institute of Arts, Department of African, Oceanic, and New World Cultures. Mr. Curtis has held positions on other art and art related board’s of directors, including; the U.S. State Department Seminarians, the Business Consortium for the Arts, The Michigan Academy of Science Arts and Letters (Arts Chair), Artists Equity (Michigan President), and Citizens for Public Art. Mr. Curtis maintains a studio/atelier, The Studio, and he owns a small manufacturing company, The Classical Gallery, Inc. Other current projects include: Founding Member of Ars Civica, The National Civic Arts Society; editing 15 books of verse written in the past ten years; an architectural treatise on the small American home. and may not be reprinted or distributed without permission from the sculptor & author.